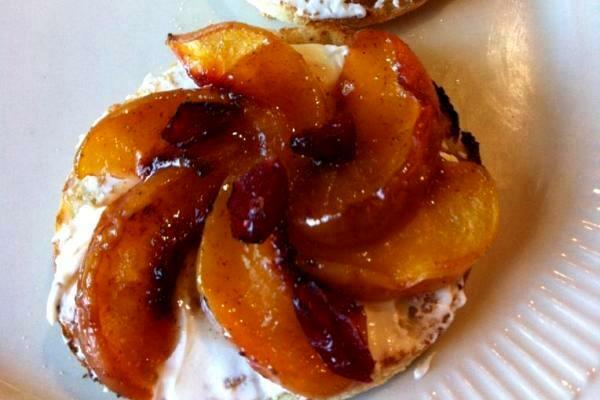 Nothing dresses up an English Muffin like some cream cheese and lightly cooked fruit. Cut the peaches into 16 equal slices and place in a single layer on a small microwave-safe plate. Drizzle with honey and dot with 2 teaspoons of butter. Cover with another microwave-safe plate, and microwave on high power for 2 minutes, or until peaches are cooked through and smell wonderfully buttery and sweet but are not completely mushy. Split open the English muffin and toast the open side. Spread evenly and lovingly with butter and cream cheese. Top with the honeyed peaches in a pretty spiral. Enjoy with tea or after a light lunch! I agree, the bagels at my dining hall were SO stale and lifeless, and English muffins never ever fail. I’m definitely gonna try the peaches with cream cheese next time I get my hands on some fresh peaches!